The Military-Family: Your next "Home" Decision? Military Housing? Apartment? Purchase a Home? Rent? Your next "Home" Decision? Military Housing? Apartment? Purchase a Home? Rent? Spring is in the air and many in the military community are expecting to PCS soon! Finding housing is usually at the top of the list for research, concern and action. What is the best housing for you? Many factors will influence your decision in this topsy turvy housing market. Today I interviewed the Senior Vice President of Michaels Military Housing, Mr Ron Hansen. Ron is a retired Army officer and what a great advocate for your housing needs! After our discussion today I realized that I needed to provide a new perspective of military housing! 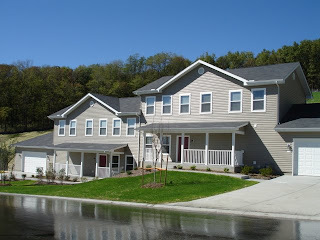 The Military Housing Initiative which was authorized by Congress in 1996 continues to impact the management and design of new housing projects for you. Ron's company MMH currently manages military housing at Andrews AFB and MacDill AFB and is in the initial development period at Ft Leavenworth, KS where they have already delivered 275 new homes. Today, MMH announced that they have assumed property management and maintenance for Army housing at Ft Huachuca and Yuma Proving Ground in Arizona. I asked Ron some questions about military housing. He kindly provided some great insight to help you decide if military housing is the direction you should go when planning that next PCS. He gave me so much great information! First, let me emphasize that military housing has seen a cultural change since the law was passed in 1996. The housing that my family lived in many times is not the same as the new housing that many military installations are seeing now. As Ron explained, the housing allowance (BAH) pays for the housing and as an entitlement it can not be reduced like old housing budgets the services had earlier. So instead of a budget that met 60% of the need, the full 100% is available. In addition, the BAH is now determined by surveying/interviews for rent, renters insurance and utilities in the installation's vicinity. So when you move on the installation you are paying rent that includes utilities and renters insurance. Personal property and liability insurance are frequently included by the corporation in the package as well to encourage your decision to live on the post, base, station, camp, etc. The housing management company has to compete for your dollars just like any other business and that is great news for you! After some of our family experiences in quarters that were below standard I was concerned about funding levels for the program and he said it is a $30B program--yep that is a lot of zeros! Old housing has been torn down, replaced or renovated. With those resources have come new innovations such as community centers in housing: playgrounds: walkways for hiking, biking, etc; and even dog parks. They are aiming for the same standards of recreation and lifestyle as a high end hotel! The facilities have a community manager and even a community concierge in some cases. He related how the community connections improve the quality of life with cooking classes, support for families with deployed spouses, etc. They have ties with MWR and can provide resources for family events that the government could not provide. In addition, they can ask other businesses to provide benefits in a business to business relationship! The customer satisfaction in military housing continues to climb! He suggested that you look at the Residential Community Initiative website for more information and pictures of Army housing. The Air Force site is at the Air Force Center for Engineering and the Environment and the Navy site is at Navy Housing One Stop! My last question to Ron: What message would you like me to get out to military families? He responded, "... that the housing is not your parents housing". Not as a cliche, but to show how many improvements have been made! Thank you Ron for your time and your enthusiastic support of military families! This is the first in a series of posts on your housing options and I hope you find them informative and please feel free to add comments or ask questions so we can provide the best possible solution to your housing choices! We will be moving to Andrews. I hope we can get on base. The number of Andrews AFB Housing available makes it easier for us to determine which kind of arrangement would best suit our needs and preferences. Although of course, we all would want to get on the base.